Dr. Eugene Antenucci is a leading dentist, both in the Bayshore area and more! His experience, compassion and constant education has made him a leading expert in the field. Dr. Antennucci has devoted thousands of hours to learning the most advanced techniques in dentistry in order to provide his patients with the best dental care available. In the process, he has created one of the most well respected dental practices not only in Long Island but throughout the United States. His professional and personal history has brought him to this point, and he, along with the team at Bay Dental Health, are ready to provide you and your family with the best care possible! Continue reading below to learn more about Dr. Antennucci's experience. Dr. Antenucci began his dental career as a United States Air Force Dentist and Captain. When he returned to New York in 1987 his private practice developed and grew into a state of the art dental facility in Huntington, NY, which was distinguished as “Dental Practice of the Month” by Dental Economics in May 2003, and “Business of the Year” by the Huntington Chamber of Commerce. Dr. Antenucci has now brought his expertise to Bayshore, Long Island, where he has created a practice which provides the most advanced technology and skills available in dentistry today. Dr. Antenucci is a 1983 graduate of New York University College of Dentistry. After this time, he received many fellowships. He was awarded his Fellowship in the Academy of General Dentistry in 1992, a Fellowship in the American College of Dentists in 1999, a Fellowship in the International College of Dentists in 2005 and yet another Fellowship in the International College of Oral Implantologists in 2011. These prestigious fellowships are educational experiences that each last one year that includes direct patient care. They are open to any dentist with a dental degree and specialty training. The fellowships are usually geared towards specific treatments and procedures in the dental world. During this time period and shortly after, he also served as a Clinical Instructor at New York University College of Dentistry in the Department of Prosthodontics and Occlusion from 1989 through 2004. Along with that, from 1995 to 2002, he was an Assistant Clinical Professor at the School of Dental Medicine at Stony Brook University in the Department of General Dentistry. He is an Attending Dentist at Montefiore Hospital and Medical Center and currently serves as a Clinical Associate after attending the two-year Continuum in Implant Surgical Training at the New York University College of Dentistry. Clearly Dr. Antennucci values education and the need for continous learning both for himself, future dentists and his peers. Dr. Antenucci has taken his education to new heights by lecutring and sharing the advancements in dentistry. These lectures have occured both on national and international soil. Dr. Antennucci has been conducting seminars in the clinical utilization of advanced technology in dentistry, a cosmetic dentistry, practice management, Planmeca FIT CAD CAM, 3D Imaging and Laser training. Dr. Antenucci is recognized as a pioneer in CAD CAM dentistry, and has conducted training seminars throughout the States, and has worked with the technology since 1996. Because of this experience, he is a National Spokesperson for Planmeca Corporation, as well as a Key Opinion Leader for Planmeca and Schein Corporations. Not only that, he also conducting training and seminars for dentists in the clinical utilization of CAD CAM and Cone Beam Imaging Technology. These trainings have an emphasis on implant treatment planning, implant surgery and implant restoration. In addition, Dr. Antenucci trains dentists in the use of lasers in the restorative dental practice. Dr. Antennucci has held many titles, some of which including the word president! Dr. Antenucci was previously the President of the Suffolk County Dental Society, New York State Academy of General Dentistry and the New York State Academy of Laser Dentistry. He currently serves on the Board of Trustees of the New York State Academy of General Dentistry and has served on numerous occasions as National Delegate for the NYSAGD at the AGD National Meeting. Dr. Antenucci is the past Chairman of the AGD Council on Annual Meetings and International Conferences, and the Past General Chairman for the Greater Long Island Dental Meeting. He has worked with the Suffolk County Medical Examiner’s Office performing forensic services related to the TWA Flight 800 disaster, and with the New York City Medical Examiner’s Office performing Forensic dental services related to September 11. Dr. Antenucci has served on the Board of Benefactors of the Guide Dog Foundation and America’s Vet Dogs. He is fluent in Italian. His wife, Karina Gentinetta, is a renowned designer and artist, based in New Orleans. Dr. Antenucci practices on Long Island in Bayshore working a condensed, busy and productive week, and commutes weekly to and from his home in New Orleans Louisiana where he has uninterrupted time to write, prepare lectures, and most importantly, enjoy life with Karina and his family. Dr. Antenucci has published a book which immediately rose to best seller status on Amazon. 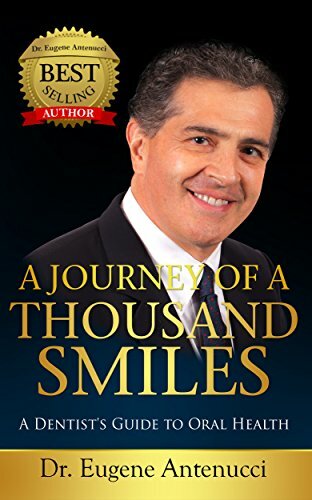 Available both in digital and hard copy format, “A Journey of a Thousand Smiles” is a guidebook for patients who want to understand what dentistry is about, and strives to show how oral health and overall health and well-being are intimately related. a person's overall health and well-being." Dr. Antenucci lectures internationally, conducting seminars in the clinical utilization of advanced technology in dentistry, as well as seminars in cosmetic dentistry, practice management, Planmeca FIT CAD CAM, 3D Imaging and Laser training.